The Removu S1 is a 3-axis stabilising gimbal designed and made for use with GoPro Hero 3, 4, 5 and Session cameras. This rainproof gimbal features a detachable handgrip, removable battery, wireless remote control and is fully compatible with GoPro’s range of helmet, body and bike mounts. The Removu S1 delivers extremely stable and vibration free footage. The 3-axis stabilisation is manufactured with world class brushless DC motors and rotary sensors, removing unwanted movements and giving your footage a smooth professional look. The motors and body of the Removu S1 are specifically designed to be water resistant. So whether your using the waterproof GoPro Hero5 or the S1’s rainproof housing for GoPro’s 3 & 4, you can keep shooting through whatever nature can throw at you! The Removu S1 comes equipped with a detachable wireless joystick remote control. This allows you to control the angle of the camera and switch between the different modes on the gimbal using the 5-way jog key on the wireless remote. 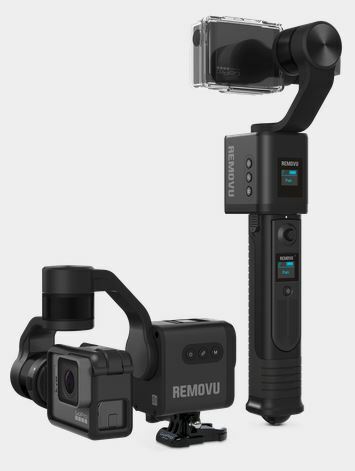 Removing the handrip from the body transforms the Removu S1 into mountable gimbal. You can attach the main gimbal body to any GoPro compatible mounting system o譠ering incredible versatility. PAN: The camera will smoothly follow your panning motion but cancel out any pitch or roll movements. FOLLOW: The camera will follow the direction the S1 is facing left, right, up and down. LOCK: The camera is locked into it’s current position and maintains that orientation regardless of how the S1 is moved. The S1 has an excellent battery life of 3-5 hours. But what makes the Removu S1 even more attractive is that once the battery does run low, you can simply swap it out for a fully charged spare! There are also two micro SD slots in the handle cap so you’ll be able to capture every second of your adventure.